I am in Germany now working with a valid work contract. I have applied for blue card 3 weeks back. It has not yet arrived. But I have a letter which says that, I have applied for a blue card (and this serves as a valid document that allows me stay in Germany legally). I came to Germany on a "German National Visa" and it expired on 23-April. They didn't extend my visa when I applied for blue card. Now I want to go back to my country (India) for an emergency. If I go back, how can I enter Germany again? If a foreigner applies for an extension of his or her residence title or for a different residence title before his or her current residence title expires, the current residence title shall be deemed to remain in force from the time of its expiry until the time of the decision by the foreigners authority. If that is the case, your residence title does not expire if you only temporarily leave the federal republic (as regulated in § 51 AufenthG) as long as the document is still valid as indicated by the sticker. Die nach Absatz 4 ausgestellten Fiktionsbescheinigungen berechtigen anders als die nach Absatz 3 ausgestellten Bescheinigungen in Verbindung mit einem anerkannten und gültigen Pass oder Passersatz zur Einreise in das Bundesgebiet und nach Artikel 21 SDÜ zu Reisen innerhalb des Schengen-Raums. Voraussetzung ist neben der Verwendung des durch die AufenthV vorgeschriebenen amtlichen Vordrucks, dass auf Seite 3 des Trägervordrucks das dritte Ankreuzfeld angekreuzt ist. Ein- und Ausreisekontrollstempel sind im Pass oder Passersatz, nicht aber auf der Fiktionsbescheinigung anzubringen. To enter the Schengen area present both your passport (which contains the old visa) and the valid Fiktionsbescheinigung at the border. Only if the third box on page 3 is ticked – the residence permit continues to be valid. Entry is allowed only in connection with an expired residence permit or visa. If the first or second box is ticked, the “Fiktionsbescheinigung” does not entail the right of entry without a visa. The Fiktionsbescheinigung could theoretically have a restriction on leaving the country which would be clearly mentioned on it but I don't think this is ever done. 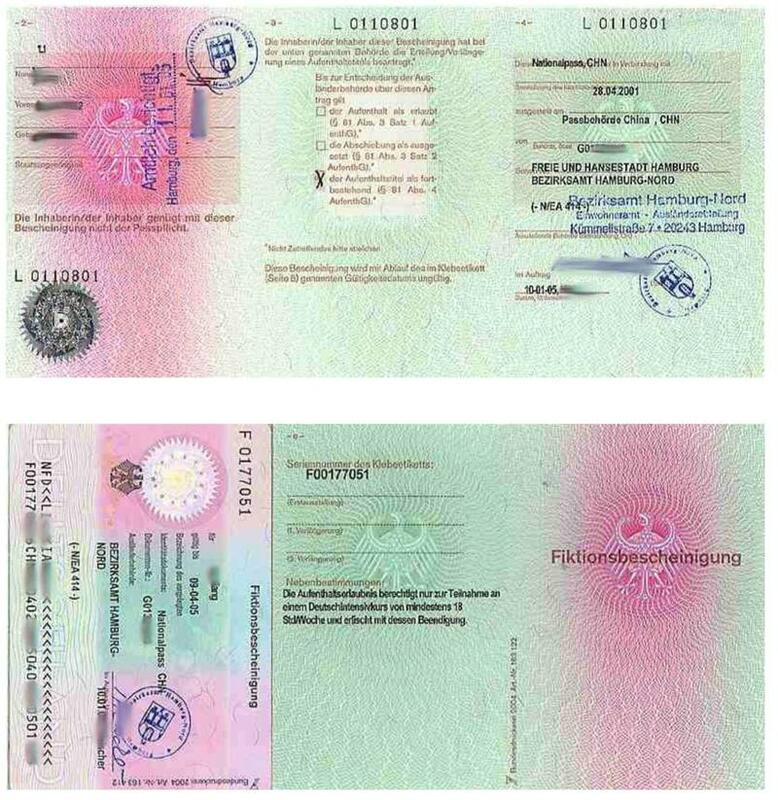 As soon as the decision on your Blue Card is made, the Fiktionsbescheinigung automatically becomes invalid. If the decision was negative, obviously you can't enter again. In any case, you should talk to your Ausländerbehörde before you leave Germany and not take advice from random stranger on the internet. Not the answer you're looking for? Browse other questions tagged germany eu or ask your own question. Would a valid German study visa create a travel history?